Solahart has a relentless pursuit of innovation and the experienced team here at Cheapa Hot Water are authorised Solahart suppliers, installers and repairers. Solahart’s research capabilities and solar testing laboratory are recognised internationally as Australia’s finest when it comes to solar hot water. They have developed a ‘Centre of Excellence’ approach for advanced technologies with an enviable Research & Development team across their manufacturing locations committed to developing the next generation of solar water heaters and assessing the latest solar energy technologies. At Cheapa Hot Water, we are authorised solar hot water system installers for the major brands including Solahart. Our solar systems are competitively priced because we purchase large quantities direct from the manufacturers – a saving we can pass on to our customers. Does a Solahart water heater take long to install? If your current hot water system breaks down, we can have you back in hot water within 24 hours. We can even install a temporary system while you wait for your installation, to take away the inconvenience of cold showers. Call us on 1800 266 999 for expert advice or complete our online enquiry form. What Solahart water system is right for us? Is the area prone to frost? We will assist you with choosing the right solar hot water system for your family size and hot water requirements. Call us on 1800 266 999 for expert advice or complete our online enquiry form. What are the environmental benefits of installing a Solahart water heater? Did you know that water heating accounts for around 25% of the average household’s energy usage. Getting your hot water free from the sun not only saves energy, it also saves the greenhouse gas emissions that would have been produced in the generation of that energy. By replacing an electric storage water heater with a Solahart solar hot water system you can reduce greenhouse gas emissions by up to 1.9 to 3.6 tonnes a year! That’s equivalent to taking one small car off the road. Solar hot water heaters are so good for the environment that you may be eligible to claim STC’s (Small-scale Technology Certificates – formerly Renewable Energy Certificates) and other government incentives to make it easier to switch to solar hot water. Call us on 1800 266 999 for more information and to discuss eligibility. Potentially how much will a Solahart water heater save me? This will vary depending on which part of Australia you live in, your current hot water system and hot water consumption. The choice of Solahart model, orientation and inclination of the system’s collectors and of course your fuel tariff. 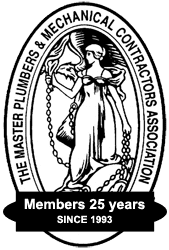 Maximum financial savings off your hot water bill are achievable when replacing an electric water heater on continuous tariff. How much roof space will I need for a solar power system? Solahart’s smallest system requires a roof area of around 11 square metres. This will generate around 30% of the average family’s energy needs each year. Solahart hot water system sizes go up to approximately 5kW. The more powerful the system, the more solar modules and roof space are needed. Is there an alternative to putting the solar water tank on the roof? Yes! Solahart’s range of streamline split system solar water heaters allows you to enjoy all the benefits of Solahart’s advanced solar technology but without the tank on the roof. The Solahart Streamline system locates the low profile collectors on your roof, with the tank installed at ground level. Alternatively you can choose a Solahart Heat Pump which uses heat pump technology to extract heat from the surrounding air, without solar collectors at all. How long does a solar hot water system take to pay for itself? Financial payback will vary depending on your individual circumstances. With the available incentives, plus the ongoing energy savings, you can begin to recoup your additional investment straight away when you remain connected to the same fuel tariff. After you recover your initial investment, the savings are yours to spend on yourself and your family, year after year. Call us on 1800 266 999 for expert advice or complete our online enquiry form. What are solar water heater boosters and why do they have them? All solar water heaters include electric or gas boosters to ensure you have hot water even during the colder, darker days of winter and on those rainy days we have from time to time. By selecting the right Solahart model that is suited to your area and your family’s hot water usage requirements, you can ensure you minimise the need to use the booster. Will my solar power system store energy for later use? A grid connected solar power system does not store energy. When you generate more power that you need, you supply the extra power into the grid. At times when you need more energy than you are producing, you draw the extra you need from the grid. Whereas a solar water heater stores it’s energy for later use in a storage tank. Will I still need mains electricity? Yes, because the inverter will only produce power when it is connected to the grid supply. What happens at night, on cloudy days, or in the case of a blackout? Solar power systems only produce electricity when they are exposed to sunlight. They do not produce electricity at night. At night you will not generate electricity from your solar modules – you will use electricity from the electricity grid. The performance of the solar power system is affected by cloud. When there is not enough light to produce electricity, you will use electricity from the grid, as you do now. In the event of a blackout, your solar power system will stop producing electricity. This safety measure is mandatory and has been put in place to protect anyone working on the blacked-out grid system. As soon as the grid is back online, your solar system will restart automatically. Should you switch to solar hot water? What hot water system is the cheapest to run?  Solar, electric or gas? How reliable is solar hot water? Solar hot water is our business – it’s not a sideline like other companies! 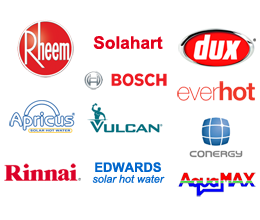 We are authorised installers and repair technicians for all the solar hot water heater brands including Solahart, Rheem, Edwards, Apricus, Quantum and many more. Our solar systems are competitively priced because we purchase large quantities direct from the manufacturers – a saving we can pass on to our customers.